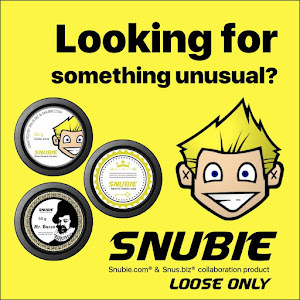 Snubie.com: Three American snus products. A little detour, but a fun experiment. 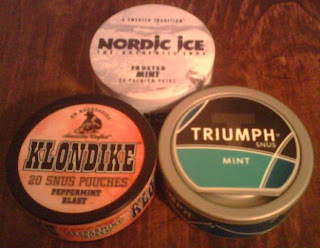 Three American snus products. A little detour, but a fun experiment. 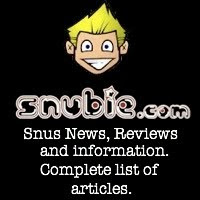 Disclaimer: Granted, I do write about American "SNUS" and "snus" from time to time, but the focus of my blog/website is introducing people to REAL Swedish Snus. 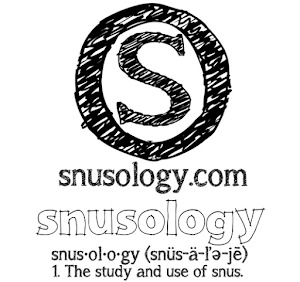 When it comes to snus, REAL Snus comes from Sweden. There's a difference, and the difference is big. Please read this article to learn the difference for yourself. 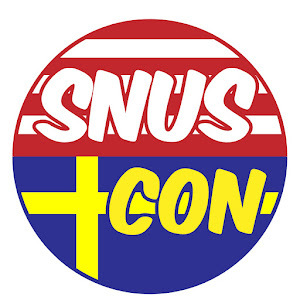 Today we're taking a side note from Swedish Snus to see what is being offered on the American market. 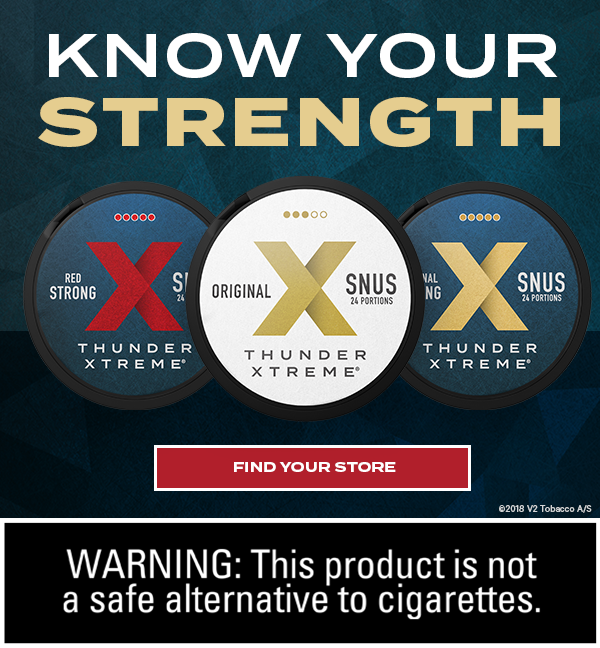 It seems as though other companies are trying to get on the bandwagon, but apparently aren't trying Swedish Snus or looking into the standards by which these other companies are making their products. Apparently, all they know is "smokeless, spitless tobacco pouch - call it snus". That's their thoughts on snus. And that, my friends, just isn't enough. 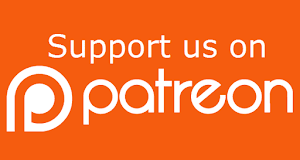 As you will see in my reviews of the two American snus products and the "American style" Swedish Snus, it just doesn't work, at all. I applaud Swedish Match for Triumph, as I believe this (other than General Mini Mint) to be a great transition into Swedish Snus. "Our Klondike brand is built on the belief that traditional smokeless tobacco consumers should have access to the Swedish snus manufacturing process, which can provide low nitrosamine levels without compromising taste, quality, and overall tobacco satisfaction traditional adult smokeless consumers are accustomed to," said Nordic American's CEO Darren Quinn. "We believe the taste, quality and tobacco satisfaction is actually enhanced by our Swedish Snus Process ", Quinn added. The Nordic Ice portions are small and dry, much like I saw with the Mocca Pomegranate. They are in the white portions. Klondike portions are dry as well, but look like original Swedish portions. The Triumph snus is in a white portion, and is larger sized, much like a white portion Swedish snus, and is slightly moist. I will be reviewing them individually as I try each of them. The only can that has a "used snus saver" top is the Triumph, because it's made by Swedish Match. For some reason, American tobacco companies have yet to catch on to the fact that this is a necessity for the snuser. Klondike Snus. The flavor I'm trying is "Peppermint Blast". Comes in 20 portions, and as you can see from the picture they look as though they were just thrown together. They look like dried out Swedish Snus Original portions. To be honest, I sat there and held one in my hand for a few minutes before I decided to even put it in. Since these are American, they don't have the Swedish Snus smell. That's good and bad. Good because people new to snus don't like the smell. But bad because you can't tell it's not a quality product. Upon putting the new portion in, I immediately noted that it was large, dry and uncomfortable. I suggest pre-wetting these portions. I'm immediately greeted with a suprise - a nice, refreshing peppermint portion. This isn't too bad. The minty taste stayed through the first 30 minutes and led into a mellow buzz. As the mint started to wear off, it does have a weird aftertaste. This isn't a swedish snus, so there isn't a salty aftertaste, but a slightly....artificial aftertaste. Like minty cardboard. However, the first 30 minutes of this snus were great. This isn't too bad, for an American product. Not too overly sweet, mildly strong. The only thing I don't like is the aftertaste, that's when it hits home and tells you that this is not a true Swedish snus. Nordic Ice. "Frosted Mint". This is like a very mild Camel Frost. Small, dry portions, much like Camel Frost. The portions are about the same size as Mocca Pomegranate, if I were to compare it to a Swedish Snus. 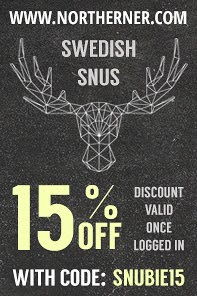 No Swedish Snus smell, just a minty aroma. To be honest, there's really no flavor to this, nothing really going on with this one. I put it in and had a little, itty bitty mint taste for a little while, but nothing exciting, nothing to write home about. The longer you have it, in the less flavor you get. I tried another portion and even pre-wet it. It's hard for me to say this, and I feel terrible (sorry Nordic), but this product is WORSE than Camel Frost. Wow. I never thought I'd say those words about a snus, but it has finally come to pass. Upon removing this one, I noticed a cardboard mint aftertaste, much like the Klondike snus. This shouldn't be called Nordic Ice. It should be Klondike Mini Mint, if we're going to be honest about the product we're selling. The best way to describe Triumph is an American flavored Swedish Snus. This product is made by Swedish Match, and by my estimation, made for those who have had their taste buds ruined by Camel Snus. My snus of choice right now is General Mini Mint. It's a quality Swedish Snus, and the only one I frequently reorder other than Mocca Pomegranate, which I use in between every 5-10 portions of General Mini Mint. Upon holding the Triumph can, I notice it looks like a Swedish Snus can. 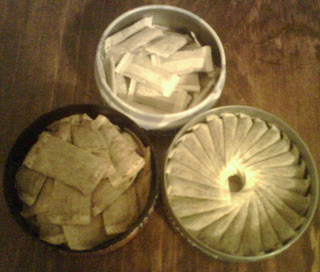 From the used snus compartment on top, to the way the snus is positioned inside, much like a regular General portion. The portions are white, and about the regular size, same as a white portion traditional Swedish Snus. The portions are only slightly moist, and are a better quality than Klondike or Nordic Ice. I consider Triumph to be the Ligget/Basic/USA Gold of the snusworld. On to the product. For Triumph being a Swedish Snus, it has NO Swedish Snus smell. It's interesting. I popped in a portion and immediately was greeted with a nice, clean mint flavor. This doesn't have any cheesy names like "Peppermint Explosion" or "Icy Extravaganza", it's just straight up Triumph MINT. No games, no BS. Would you expect less from Swedish Match. That being said, this is a mild snus. Nothing too strong, overbearing, just a mild, smooth, mint taste. 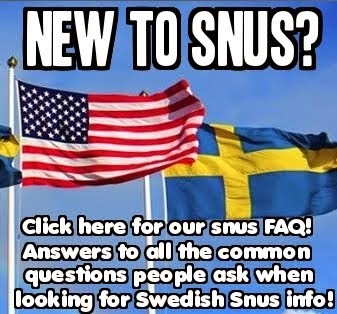 This would be a great step between Camel Frost and real Swedish Snus, although I still stand by General Mini Mint as the perfect transitionally snus for the average snubie. This has a clean, mint taste all the way through. The other two had no drip, this is the first one out of the 3 I got today that has a drip. It has a strong, mint drip. Very good taste though, Swedish Match should put this as the next step up General Mini Mint and call it "General Mint" and make it just a little stronger and a little more Swedish. 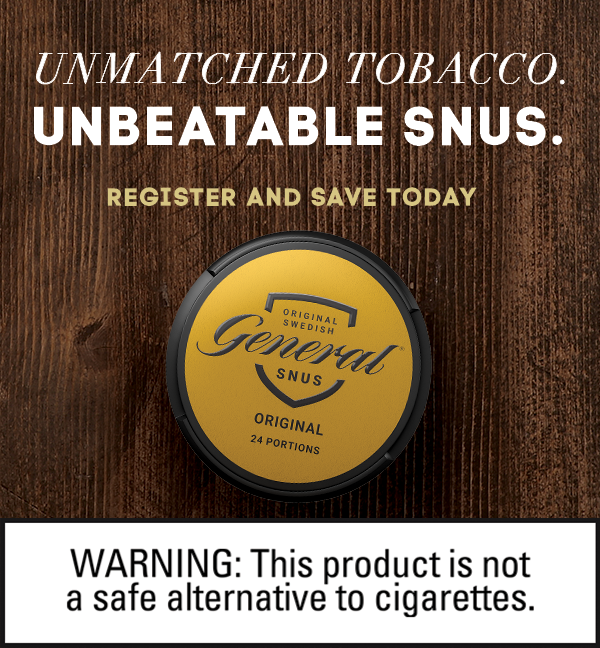 For people in the states not quite ready to order a Swedish Snus, I suggest trying it if you see it. It's a good product. Not as good, again, as General Mini Mint. But it was better than I expected. The cans. As you can tell from the opened ones, the only portion that actually looks good is the Triumph (thanks to Swedish Match). The other two look like they were left out to dry and just thrown in. You can't tell from the pictures, but if you pick them up and examine them, they're pretty rough. You would think they would try to imitate Swedish Snus and not Camel Frost. The only one good out of this batch is the "American style" Swedish Snus - Triumph.